Governor Jerry Brown's decision to put his foot down was well timed. Reports from local water agencies around the state show that on average in February, Californians did their poorest job at conserving water since the state began tracking water use last summer. Urban water savings in February were 2.8 percent, compared to the baseline year of 2013. Conservation efforts peaked in December at just over 22 percent savings, but December's weather skewed the results, as property owners cut back on watering amid persistent rains. On a per-capita basis, the State Water Resources Control Board reported that Californians' use of water actually rose in February, from 73 gallons per person, per day, to 77 gallons. The averages conceal the progress that many communities have made. 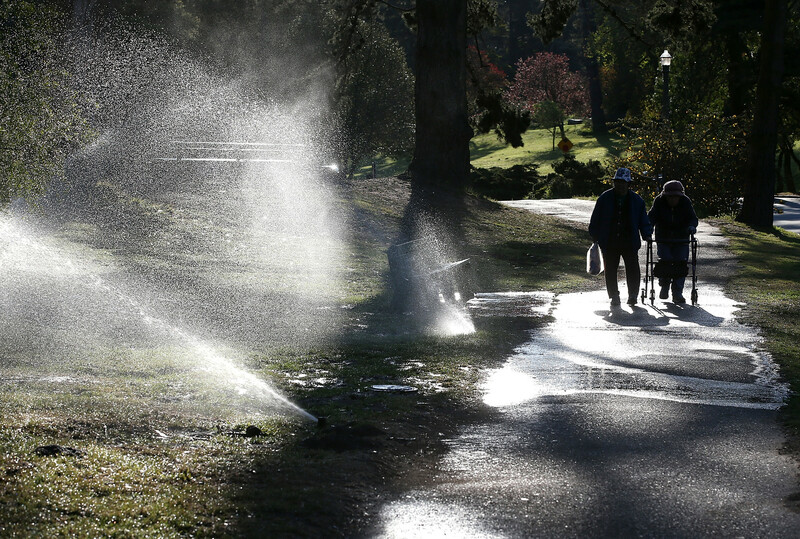 Livermore, Tracy, Stockton and Roseville, inland cities with relatively warm temperatures and abundant lawns, all made regulators' honor roll of towns that cut water use more than 15 percent and reduced the closely watched per capita use to under 60 gallons per day. Still, water board chair Felicia Marcus says she finds the broad numbers "sobering and disheartening." Recent statewide polling indicates that Californians are ready to roll up their sleeves to save water. A March survey by the Public Policy Institute of California found that water and drought remain at the top of Californians' concerns, tied with jobs and the economy, and that fully two-thirds say they don't think enough is being done in response to the drought. Against this backdrop, officials face the task of figuring out how to implement the governor's 31-point conservation mandate, announced on April 1. Marcus said the governor was aware that the February numbers would be "bad" before he unveiled his new program. "We have a very tight timeline for trying to implement this order from the governor," says Max Gomberg, a senior scientist at the water board. Aspects of the mandate remain murky, such as the proscriptions on landscaping for new homes. By mid-May, regulators hope to have specific regulations in place to achieve Brown's goal of 25 percent water savings across the board. Under the plan, the state will assign localities specific reduction targets based on how they're already doing in terms of per-capita daily water consumption. Under a proposed framework for the regulation, targets would range from 10 percent for the most efficient areas, such as San Francisco and Santa Cruz to 35 percent for persistently heavy users such as Hillsborough and West Sacramento. Much of Southern California is at the high end, though officials cited San Diego as a standout water saver. All told, officials say that Californians have saved 148 billion gallons of water since conservation efforts began in earnest last summer. Gomberg says that's a year's worth of water for two million people. To see how your city stacks up, view the full list of proposed mandatory conservation targets.